Sales-houses, media agencies and advertisers seek to gain agility, interaction, and to generate the best results at each step of the selling and the buying process. CSE, the leading French company in the market of the advertising sales systems, has developed the first platform capable of integrating services dedicated to these players. With Media Services, each sales-house has a flexible solution to change its way to sell and communicate. At the heart of relationships and transactions, Media Services makes it possible to interact and accelerate exchanges with media agencies, advertisers, broadcasters/publishers and sales teams. All information is available 24/7 in real time and on the go. When flows tend to be more and more complex, the services offered by the platform are easy to use and smooth. As standard, all the services already integrated with Media Pilot software to manage and anticipate the needs of the sales-houses and their customers. Export data (Data export service): Excel export of predefined data (GRP, status…) relative to campaigns and spots, numerous selection criteria with backup of search filters per user. Develop the sale of spaces (Commercial offers service): access to commercial packages according to many criteria, putting these offers online in one click via Media Pilot, pre-ordering of packages, automatic update of the CRM module of Media Pilot. 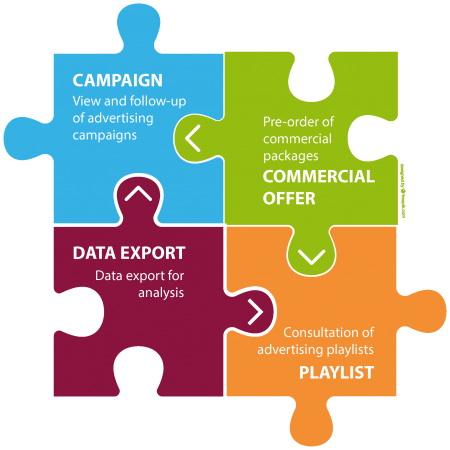 Consult advertising playlists (Playlist service): real-time access to the planning of spots in the commercial breaks with the possibility of PDF or Excel export. 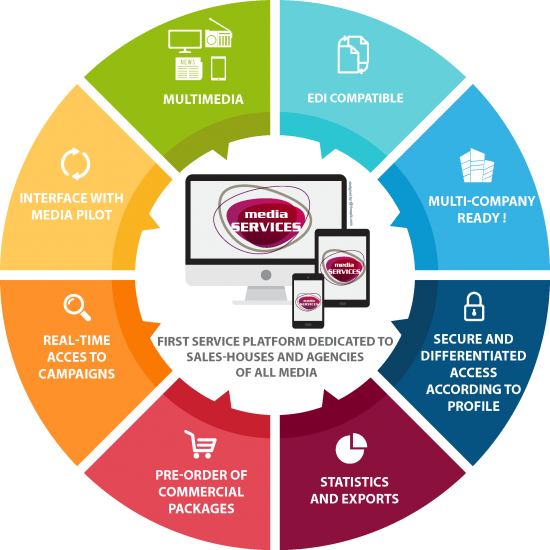 For sales-houses, Media Services promotes agility, frees up time to focus on tailor-made operations, improves exchanges with agencies, offers customers the purchase of packaged offers and is the first step to an automatic buying process. For agencies, Media Service saves time and offers reliability with real-time access to information for tailored analysis. The availability of data from multiple sales-houses on the same web platform is planned in Media Services, providing agencies with a global view of their purchases. All sales-houses using Media Pilot (70% of multimedia companies equipped with a standard product in France) can activate Media Services and get all the standard features without any re-entry. The installation is fast, the handling is extremely intuitive and the services are accessible on the go. Media Services is a scalable platform, it is possible to develop customized services on demand. Other sales-houses may also integrate Media Services platform via interfaces. Media Services is technically designed for advertisers and media agencies to access data and offers from multiple sales-houses in real-time: multi-base interconnection is operational if the sales-houses decide to implement it. “Thanks to the business expertise of the CSE team, Media Services was designed and developed in two years in collaboration with sales-houses, allowing to put on the market an innovative, multi-sales-house and cross-platform solution (TV, radio, digital, press) for a very competitive budget. We are already working on the new services planned in 2018, such as the briefing.” says Jean-Marc Leoni, President of CSE. CSE is the leading French company in the market of cross-media ad sales systems. For over 25 years, CSE has been supporting major media groups, independent sales-houses and television channels with a wide range of high-performance software and recognized quality of service.